Zika: Spread by Earth’s Most Dangerous Animal, MOSQUITO! Zika virus is the recent scare in the news! It is another in a long line of zoonoses — diseases transmitted from one species to another. Zika is a subtle yet damaging disease, transmitted by mosquito. According to WHO, mosquitoes kill 725,000 people a year! The closest second place is snakes, who kill only 50,000 a year. Of course, 500,000 die from malaria, then there is Ebola, Lhassa, Dengue, Chickungunya. Believe it or not, the subtlety of Zika is that it looks like a mild condition, yet it has devastating consequences to fetus development. Only one in five people actually get sick! Those who do, onset is 3 to 12 days after the mosquito bite. Later, however, if this has happened to a pregnant woman — or if transmitted by sexual contact with a man who acquired it from a mosquito — the fetus is born with microcephaly (shrunken brain development in a small head). There are many more fetal development problems that would show later even if the fetus were to survive. Researchers are still discovering a variety of such developmental problems resulting from nervous system damage. Some adults who acquire the virus later develop Guillain-Barré syndrome — a paralytic condition leading to incoordination similar to Multiple Sclerosis. Though microcephaly rates in Brazil in the past year has increased by 20-fold, triggering massive media panic, the truth is that this disease has been around for a long time. Zika virus was first detected in Rhesus macaques in the Zika Forest of Uganda. By 1951, and later in 1981, outbreaks occurred in Africa and Asia. In 2007, 73% of the population of Polynesia had the illness! So far, Zika has spread to 48 countries, mostly Americas, Pacific Islands, and Africa. CDC states currently that there have been 1,132 confirmed cases in the US, all of them who have travelled in infested areas or by sexual transmission. 2,526 were found in US territories. CDC also has found 10 cases of sexual transmission. Hence, they are recommending diligent condom use in travelers to infested areas, including Olympic athletes. Very recently, a first case of female-to-male sexual transmission has been detected by CDC. Now that that the Brazil outbreak has drawn attention, the virus has been detected in mosquitoes throughout South America and the Caribbean. Predictions are that cases will develop in the Gulf Coast soon. One weakened elderly individual in Utah died recently after having travelled to infested areas. Other than sexual transmission, spread does NOT occur by touch or cough or sneeze. Transmission is by mosquito bite of a person, infecting that person. Then another uninfected mosquito bites that person before spreading to another person. WHO warns that the Olympics in Brazil, drawing visitors from all over the world, will cause the epidemic to spread through the world! WHO declares this epidemic to be an International public health emergency! Because only one in five people get sick, treatment is not practical, even by MDinyourHand.com. FDA has approved Inovio Pharmaceuticals to make a vaccine, but this is not yet available and will take time to test. 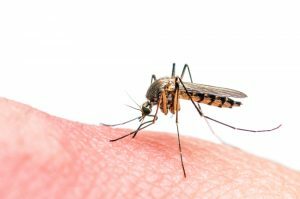 What can be done about mosquitoes? Of course, mosquito nets are cheap and effective for nighttime and napping. Keeping covered during the day is very effective but often impractical. We know that mosquitoes are most active during sunrise and sunset, but they can be active at other times as well. The female is the one who bites. Mosquitoes are drawn by Carbon Dioxide from a distance of 164 feet. Closer in, they are attracted to skin with uric acid, cholesterol, and steroids. Mosquitoes breed in standing water. So prevention is best by scouring your area and eliminating standing water. Fountains are fine, or any other kind of moving water. In a large rainwater bin too heavy to tip over, Mosquito Guard has a non-toxic (to fish, insects, bees) product that uses oil of lemon eucalyptus, 25-30% to be added to the water. CDC recommends individuals apply or spray on the skin DEET 25-30%, which lasts 6 to 8 hrs. It can be toxic, so it should be washed off after use. It should be applied thinly over all exposed areas, carefully avoiding eyes and mouth. Children should not apply or spray themselves. CDC recommends not using DEET in children less than 2 months old. This is very informative! People need to know how this virus spreads so we can take preventative measures. Thanks for sharing this!